The Clinton campaign's response to new Pay for Play allegations is just plain nonsense! Hillary is the architect of her own greed. She will also be the one who pays in the end. The premise that after constructing a Foundation of Free Cash, the media still wants us to believe that she is squeaky clean and maligned only by the Right. This is pure fiction and possibly bordering on delusion. 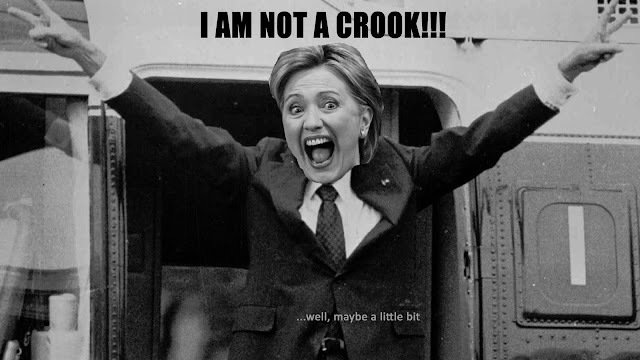 There is now a litany of dots to connect Hillary and Bill to some shady dealings at home and around the world. hidden in an issue and claim victory. It shudders me to think that these are the people who are leading this country. The level of corruption and deceit is astounding, add to it the arrogance and disrespect shown to the American public. This time will be remembered in history as a Tribulation of the American Dream. A time when the evils of a ruptured society was forced to make a choice between conscience and greed. Conscience requires self examination and adjustment to positive outcomes. Greed requires exploitation for status and power. What we are seeing in our political arena is an onslaught of behaviors that have been created and cultivated by the Clintons. These are the methods that the Democrat party has adopted to win across the American Political spectrum. Innuendo, slander and misinformation, no matter how untrue does have an effect on elections. It's why the majority of Hillary's campaign is based on the above. Hillary loses when defending her scandalous behaviors and trying to give logical explanations. Hence the lack of Press Conferences and Scripted Responses. And yet, no matter how many shady deals and lack of transparency, somehow, someway she is still leading in the polls. Hillary is a terrible candidate by any, and all standards. The American people need to ask themselves some serious questions, not only regarding Hillary, but about themselves. The nexus of the problem is with us. Hillary Clinton, or any other politician cannot stand alone without a constituency. Have we become so flawed in our behaviors or perceptions that only the loudest, or most egregious among us gets noticed any longer? Will the heart and soul of this American Experience find itself once more?